How to Modify a Parking Lot to Promote Pedestrian Safety | ACI ASPHALT & CONCRETE INC.
← What is Cold Mix Permanent Patching? As a real estate owner, your parking lot says a lot about your commitment to customer and employee safety. When it is in great condition, not only do vehicles run smoother and experience less damage, pedestrians are well-guided and protected, thus supporting a safe premises for both staff and guests. However, when you neglect the maintenance needs of a parking lot, whether asphalt or concrete, you can expect a heap of structural problems that may create an unsafe environment. Continue reading to learn which areas of your parking lot can be improved to promote pedestrian safety, as well as, who to call for trusted pavement repair near you. Whether concrete or asphalt, parking lots require ongoing maintenance. Overtime, freeze-thaw cycles, heavy traffic, inclement weather, biological growths, and more, can cause pavements to lose their strength and durability. By staying on top of pavement care, you can better prevent or delay such effects. Pavement maintenance can also be a very serious responsibility, and even an obligation, under tort law. You see, if someone is seriously injured on your property as a result of negligent parking lot care, you could be held financially liable for their economic and non-economic damages and losses. When it comes to maintaining a safe premises, pavement maintenance is key. This means staying on top of routine care and minor repairs. There are several types of pavement damage that can lead to unsafe or hazardous conditions for people. Potholes, faded road marks, crumbling curbs, unleveled sidewalks, loose handrails, cracked ramps, and more, are all potentially dangerous defects of a parking that can cause someone to suffer an accident or injury. ⛖ Line Striping – When parking lot road markings begin to fade, it can lead to serious accidents. This is especially true for pedestrian crosswalks, directional arrows, and other indicator-based markings. If there areas are not perfectly visible, both drivers and pedestrians can become confused on where (and where not) to go. ⛗ Handicap Spaces – Painted handicap parking spaces should be perfectly visible at all times. 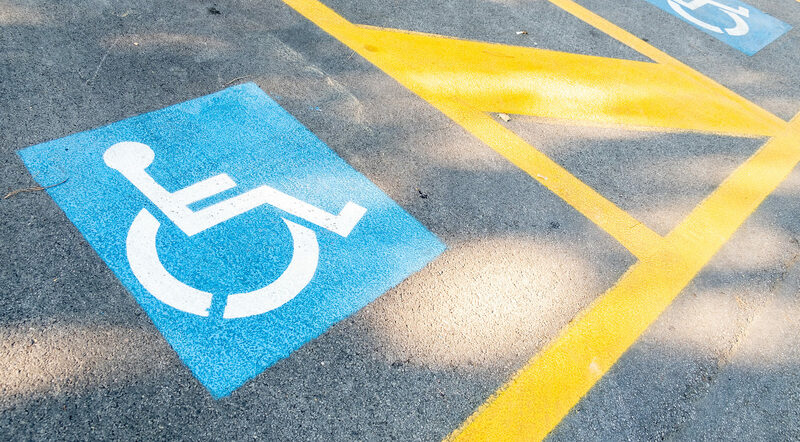 If they start to fade, drivers may not be aware that the spaces exists and occupy the spot, which may force handicap individuals to walk farther than they should, potentially putting them at risk of being hit by a car or slipping and falling. ⛖ ADA Ramps – ADA ramps are another important consideration, especially for disabled or handicapped individuals. Overtime, ramps can deteriorate, which can lead to crumbling aggregate, unleveled surfaces, holes, and more. ⛗ Water Drainage – Poor water drainage will cause a wide range of structural damages, such as potholes, but it can also lead to flooding, which can pose certain safety hazards for both drivers and pedestrians. A flooded parking lot is not safe to walk and it can block important emergency exits. For drivers, it can cause skidding and wipe-outs, which puts everyone at risk. ⛖ Potholes – Potholes and wide gaps in a parking lot can be quite hazardous to anyone on foot. These form as a result of freeze-thaw cycles, and worsen from lack of maintenance and surrounding environmental conditions. It is important to repair potholes as soon as they form to prevent accidents, as well as, worsening pavement conditions. If your parking lot has any of the above defects, it is strongly encouraged to have them resolved before the heaviest part of winter is here. To get started, contact a licensed Indianapolis pavement repair company for a professional assessment and written quote. 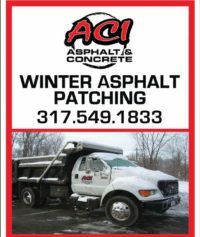 Call ACI Asphalt and Concrete Inc. at 317-549-1833 for parking lot paving services in Indianapolis and its surrounding areas. Our licensed and qualified paving contractors provide a wide range of pavement repair and installation services at the most competitive prices in town. Request a free estimate, today. This entry was posted in Pavement Repair and tagged Indianapolis Parking Lot Paving, Indianapolis Parking Lot Repair, Indianapolis Paving Contractors, parking lot maintenance, Parking Lot repairs safety, Parking Lot safety, tips pedestrian safety. Bookmark the permalink.